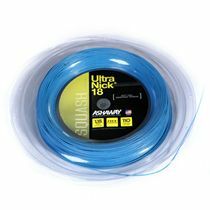 The Ashaway UltraNick 18 squash string features the Zyex multifilament construction that provides superior power and softer feel, with the braided surface that increases control and spin. The string provides superb tension stability at all tensions and is recommended for all range of ability levels, and for players seeking a softer playing string with excellent power and control. It features 1.15mm gauge and is 9 metres (30ft.) long. for submitting product information about Ashaway UltraNick 18 Squash String - 9m set We aim to answer all questions within 2-3 days. 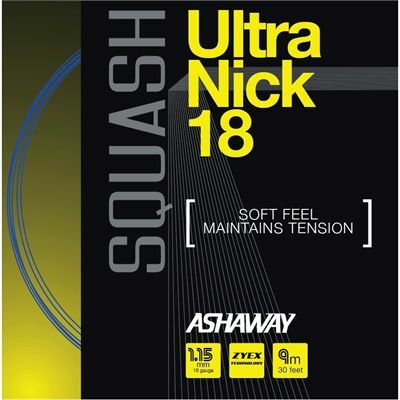 for submitting product information about Ashaway UltraNick 18 Squash String - 9m set. We aim to answer all questions within 2-3 days. If you provided your name and email address, we will email you as soon as the answer is published. for submitting product review about Ashaway UltraNick 18 Squash String - 9m set.